A root canal – or pulpectomy – is needed when a tooth suffers severe decay or infection. Many people wince when they even hear the term “root canal,” but when performed by a skilled and experienced dentist, root canals are largely painless. In fact, one of the purposes of a root canal is to eliminate the pain of a decayed tooth. A root canal is actually not unlike a typical filling from the patient’s point of view. The procedure takes one to two office visits and removes the infected pulp, a type of soft tissue, from inside the tooth. Best of all, a root canal allows you to keep your tooth without the need for extraction. Modern root canals are virtually painless. You’ll receive appropriate anesthetic, and Dr. Govani will strive to ensure you experience minimal discomfort. 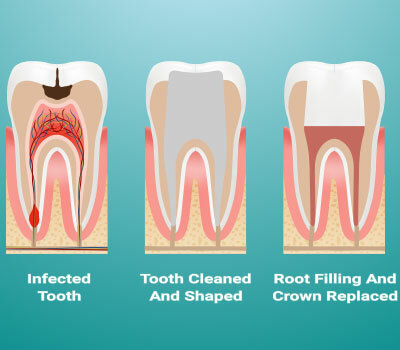 A root canal can address advanced decay before it gets to the point where you need a tooth extraction. This allows you to keep your natural tooth without having to worry about a replacement. A root canal will also stop the pain associated with an infected or decayed tooth. Call North Penn Dental Care at (215) 822-9600 if you’re experiencing any sort of tooth pain. We’ll get to the root of your problem! "Another great checkup. Dr. Govani and his staff provide a comfortable environment, thorough checkups, and take the time to answer any dental care questions. Thanks for your continued care!" - M. N.